This diminutive succulent has dark green foliage growing only 1-2” in height. It has white starry flowers with yellow eyes, blooming May to June and then occasionally throughout the summer. It is a drought tolerant beauty. 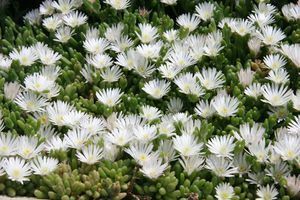 Try it with Delosperma Basutoland, Sedum Major or other groundcovers in your rock garden and container garden.